Selecting German electric radiators is NOT rocket science. There’s some disinformation out there about German electric radiators. Much of it is dispensed by companies that want to persuade you to buy their product. We want you to know that electric heating is not as complicated as they would have you think. Sometimes companies present you with supposed complications, in order to justify a visit from their sales person (whom they may describe as an engineer). Sometimes they offer a solution for problems that aren’t really there, to add some perception of value for money. A home survey, carried out by an engineer, may seem like a good idea when you’re investing in a new electric heating system. Having a specialist team of installers might also appeal. An expert, dedicated to reducing the amount that you pay for your electricity probably sounds great. The reality though, is that you will likely pay a big premium for very little. Our advice would be to insist on a price list before going any further. Without any idea on pricing, it’s impossible to know if it’s within your budget. Ask for an example price at the very least. 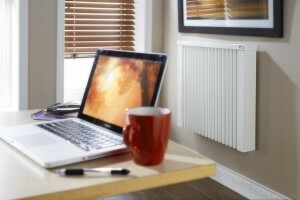 Every supplier of German-made electric heating systems will stock a mid-sized 2.0kw radiator. Ask them what it costs. The answer should be readily available. Obviously, a larger radiator will cost more to buy than a smaller one. It will not use more power though. If the electric radiator is thermostatically controlled, it will draw only as much power as is needed, to reach your set temperature. The price difference between our 2.0kw and 2.5kw radiator is just £20. Choosing a radiator that is too small for an area can be problematic, as it may fail to raise the room temperature sufficiently. When specifying radiators for our customers at Ecopower Heating, we allow for a margin in our calculations, to make sure that all areas have enough heat output at all times. All you really need do is complete the Get a Quote Page. It’s impossible for a “surveyor” to determine much about heat-loss characteristics with just a tape measure. They will normally just measure-up, demonstrate a radiator, and then present you with some optimistic running costs, and a very high price. Usually the price is negotiable, if you agree to pay an immediate deposit. Installation is easy. Mounting a radiator to the wall usually requires just four screws. If any electrical work is required, this can be carried out by any suitably qualified person – usually at a much lower cost. This is by no means specialist work. We will be pleased to advise you on this, and even recommend some great people, who don’t charge the earth. Changing tariff is simple. OFGEM introduced rules, which all energy suppliers should follow. They will be legally enforced next year. Suppliers must give you the best deal for your personal requirements, and they must make the process simple. The large number of tariffs was confusing, so now they have to be reduced, and simplified. There are comparison websites online to help you. When it comes to German-made electric radiators , there’s little to separate them. Any which carry the VDE and GS marks, are of a very high quality. The materials used in the production of these radiators are usually the same. A high-grade powder-coated steel is used for the outer casing, and a number of ceramic (Fireclay Chamotte) plates make up the interior. It’s great for their cash-flow, but not for you. Not stocking a product is a sure sign that it is actually not very popular. We distribute in large volumes throughout the year, so we hold stock. By holding bulk quantities, we are able to supply to you at a low price, and at a time that suits you. At Ecopower Heating we provide the best value for money for all of our customers. You can expect to receive the highest level of expert customer service. The quality of the Economiser and Vantage Radiator ranges is the best that you will find anywhere.